Apart from parameters used for creating characteristics, PDMS also handles additional parameters that ensure the correct behavior of the protection devices in the field. All parameters can be imported from Excel lists or XML files and are accessible through dialogs. 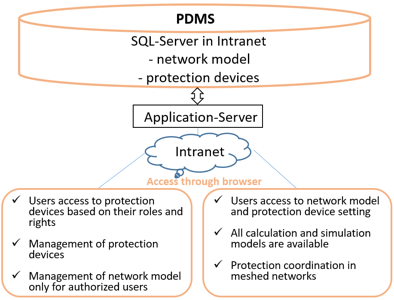 Using a sophisticated user administration scheme, PDMS offers different types of accessibility to the master data base that contains the complete network model and all protection devices. 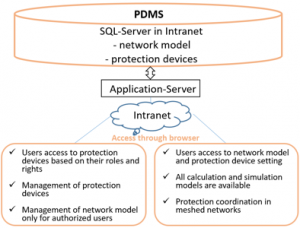 Intranet users have direct access to PDMS database. Desktop users store their project in a local database with bidirectional communication with the PDMS database.